Online Travel Agencies (OTAs) like Expedia and Booking.com are responsible for a large proportion of online hotel room reservations but at the same time demand 10-15% in commission fees. Independent hotels are particularly OTA-dependent – on average, more than 42% of independent hotel rooms are reserved online but unfortunately, only 24% of these bookings come via the hotel website, while 76% percent are made through OTAs. (Source: STR, HSMAI Foundation). Yes you heard me right, OTAs can drive direct bookings! OTAs are popular for initial research – according to Tripadvisor, 57% of people surveyed worldwide used an OTA to help plan their travel. But this doesn’t have to mean booking through them too. 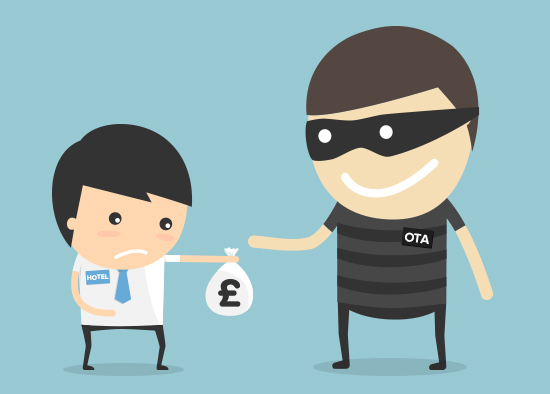 Google observes that 52% of travellers visit your hotel website after seeing you on an OTA. This is the perfect time to begin your engagement. Use your OTA to build awareness and your brand but make sure you do everything in your power to ensure that once they land on your website, they stay there to book! Once your customer has landed on your website they will be wanting to find more information about your hotel to decide if they want to stay there and also researching where they will get the best deal. Unfortunately, according to RateGain, 65%–98% of 4* hotels offer their rooms cheaper on OTA sites rather than on their own. Research shows that most customers would prefer to book directly with the hotel providing they can do so easily and the rates are comparable. So ensure you are publically marketing the same deals via your website and through your own marketing and advertising. Offering the same rate as your OTA is not enough to seal the deal however. Although you can’t publically offer a lower room rate than that offered by your OTA, you can offer added incentive for customers to book directly with you. Ensure you match the basic room rate with your OTA and then throw in some extras – think free upgrades, inclusive breakfast, a drink from the bar, late check out, or a bottle of wine or box of chocolates. You could also consider creating your very own bespoke packages, only available to book via your website, like spa deals, inclusive parking or tickets to a local attraction or theatre. Although the basic room rate is the same as your OTA is offering, the value is perceived as much higher by your customer. Over time your repeat guests will learn that the best offers and deals are only available on your website. Ensure you use digital marketing techniques to spread your offer far and wide and encourage social sharing. Don’t underestimate how powerful your website can be – it is most often the first impression a customer will get of your hotel and can win or lose you business. Ensure your best rates are clearly advertised and explain why it is better to book with you directly (e.g. added incentives). Go responsive: your website will be viewed by different people on different devices all looking for different things. Remember bookings made via mobile devices are increasing tenfold whilst desktop website revenue is dipping. Provide people with information best suited to the device they are viewing it on to maximise bookings. Check your booking engine is as simple to use as an OTA. Consider mimicking the look and feel of the OTA booking process. Audit your booking process on multiple platforms to ensure there are no barriers to booking. Make sure your hotel descriptions, room types etc are consistently described on your website and on the OTA to avoid confusion. Invest in your own marketing and brand: plan to allocate around 4-6% of your room revenue into your own marketing and advertising to reap the rewards. Integrate with social channels to allow your potential guests to pin you on their travel plans, like you on Facebook or subscribe to your newsletter to receive your latest deals, follow your Twitter feed to get an idea of the hotel’s atmosphere, and pull in real time reviews from Tripadvisor. Use email newsletters to promote the offers only available on your own website, to encourage guests to post a review on Tripadvisor after a visit, or to offer guests previously booked via OTAs a discount if they book directly next time. Finally ensure your staff are educated to promote the ‘Book Direct’ action plan. Make sure they know all the latest offers and deals and that they can easily explain the benefits of booking directly. Provide guests who booked via an OTA with a personalised email from the GM offering them a discounted rate if they book directly next time. Ensure check-in staff are briefed to collate email addresses from guests who booked via OTAs so you can include them in your future marketing. Want to learn more? Sign up for a Wisetiger Hotel Website Healthcheck and receive a personalised expert review of how your website is performing.